A firework is a carefully engineered explosive that was invented in China and is used to deliver visual and audible celebration across the world. In the United States, best known for the celebration of Independence Day (July 4th). Seen at entertainment destinations, festivals and amusement parks year round, especially vacation destinations like Disneyland, Disneyworld, and Hilton Hawaiian Village in Waikiki, Hawaii. An emoji of celebration, entertainment and excitement. On the 4th of July you might light these. Similar to the Sparkle icon. In fact they are the same. No sweat of our backs though. Keep up the good work Apple! 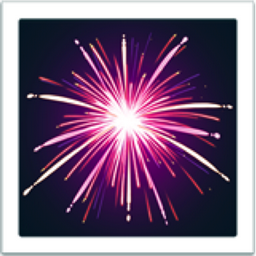 old iEmoji name: Bright Star at Night A bright yellow shown glinting or twinkling at night.